The Bottom Line: A historical novel that documents notable early 20th century events through the eyes of a hotel heiress, including world war, celebrity kidnapping, women’s suffrage and prohibition. Trevor C. D’Silva’s Fateful Decisions is the story of Rachel Johnson, the survivor of a submarine attack who proves to be instrumental in some of the 20th centuries’ most important social and economic developments. In 1915, while World War I raged in Europe, Rachel unwittingly boards the RMS Lusitania, a British ocean liner that was famously sunk by a German U-Boat, an event that eventually led to the United States’ entry into World War I, and Germany’s defeat. But Fateful Decisions’ narrative doesn’t tread into the halls of world leaders. Instead, it wisely maintains sharp focus on Rachel, who begins to fall for fellow passenger Fred Johnson before the German torpedo ends their journey, and ironically, begins her new life. The novel may begin as a love story aboard a ship destined for tragedy, but unlike Titanic, it doesn’t end there. Instead, it quickly becomes about the plight of a woman who finds herself among the most powerful females in American business. D’Silva uses Rachel as a vehicle through which we experience important American historical events from a female perspective, including prohibition, women’s suffrage and an event very close in narrative to the famous Lindberg baby kidnapping case. 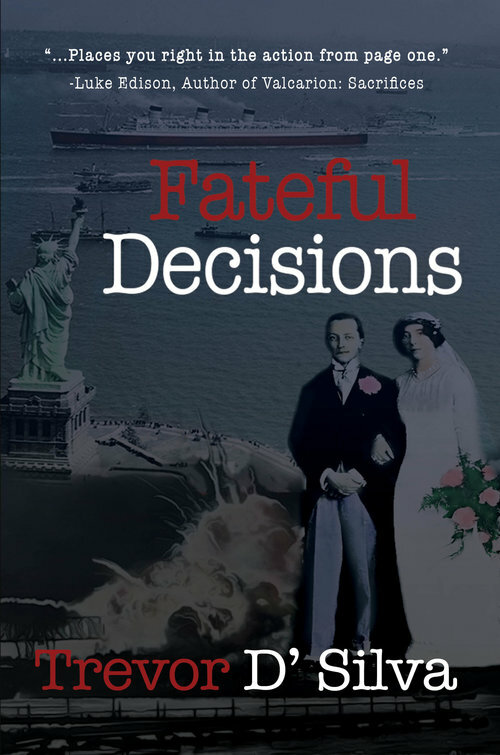 From that perspective, Fateful Decisions is an intriguing read for fans of historical fiction. D’Silva’s style is a straightforward one that is more reminiscent of an objective biographer than a fiction writer. There are no flashy allegories or landscape descriptions here. It’s also a quick read, with three decades of history packed into a novel that clocks in at an efficient 350 pages.